Located to the west of Parc national du Mont Tremblant, in the Diable Sector, Lac Monroe is one of the most popular lakes for visitors to the park. Among the activities available are canoeing, and hiking the extensive network of wilderness trails. Situated in the beautiful Parc national du Mont Tremblant, Lac Monroe offers an abundance of recreational opportunities. A basic campground is found on the shores of the lake - offering temporary waterfront real estate. Visitors can launch a canoe from the sandy shores of Lac Monroe and explore the lake edge fringed by dense forest. During the height of fall the forest is exquisitely clothed in bright colors of golds and reds! The entire park consists of approximately 1510 sq km of wilderness hiking trails - endless opportunities to explore Parc national du Mont Tremblant by foot while taking in the majestic wilderness of the Laurentides region of Quebec. Canoe on the shore of Lac Monroe during fall in Parc national du Mont Tremblant, a Provincial Park of Quebec, Laurentides, Quebec, Canada. 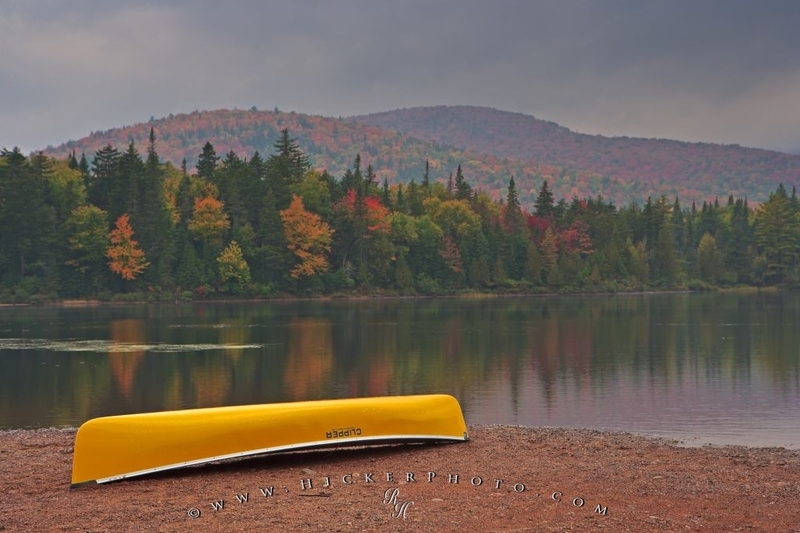 Photo of a canoe on the shore of Lac Monroe - deep in the wilderness of Mont Tremblant Provincial Park, Quebec. Pictures from photo gallery "Fall Pictures"
This picture is part of the photo album "Fall Pictures" - there are more beautiful images waiting for you.